I have a few roadrunners hanging around my work and it is such a joy to watch then every day. I have seen many roadrunners in my life but being able to truly watch them interact and go about thier day really is a blessing. The other day I was raking my work site and one of the roadrunners was across the street under a tree. He shed a feather and then the wind kicked up and carried the feather across the street and iht over to me where it landed at my feet. 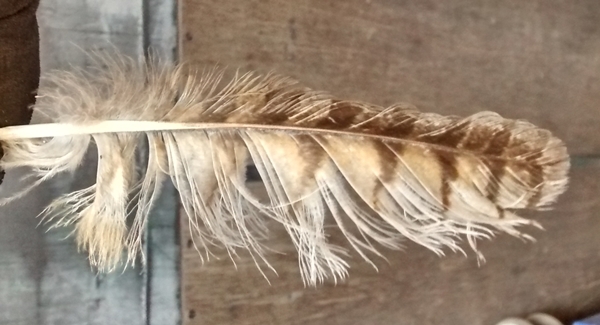 This is a photo of the feather. Road Runner teaches the ability of mental sharpness, quick thinking and fast responses and reflexes and knowing when to strike quickly and efficiently at ideas with timing and precision. He will show the correct direction to take with proper uses of timing and speed in order make quick changes. Is it time to slow down or speed up? Are you being agile in thoughts and opinions? Roadrunner aids in physiological and behavioral adaptations along with conservation of energy when needed. Are you ready for a burst of flight in mental, emotional, physical areas? Are you balancing incoming and outgoing energies, mental and emotional areas, diet and exercise? Road Runner will show how to adapt the fast approaching movements with harmony and grace. I can completely see where this message fits into my life at this moment. There is a lot going on with me and there are changes coming and chances for me to spread my wings and fly. There are definitely approaching moments that could use mental sharpness, quick thinking and fast responses, as well as adaptation for me. I take this gift as a message that I am on the right track and headed in the right direction. IT also helps remind me to get ready for the changes and be willing to adapt as everything new approaches. I am going to make a smudge fan out of the feather and will post about it once it is done. I gratefully accept all the gifts the Universe and the roadrunners choose to send my way.